This mother of two decided that she had lived with an ugly crown for long enough. The metal core crown on her front tooth was obviously fake and it showed. She wanted a natural smile that you couldn’t tell what wasn’t real. She went ahead with professional whitening, and four new crowns for the front teeth. 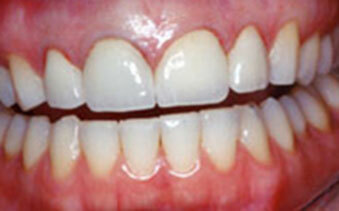 She had four all ceramic crowns done to even out the space, the biting edge and the lighten the overall color. Her new smile is now very natural, even and beautiful.